PRESIDENT Emmerson Mnangagwa has said Government is considering declaring November 21 as the day of national peace. He said this at the Peace and Family Festival that was held on Wednesday at the National Sports Stadium in Harare. 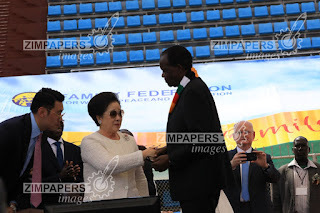 In a speech read on his behalf by Zanu-PF Politburo member, Cde Josiah Hungwe at the festival attended by thousands of couples from all over the world, the President said the country needs peace to achieve set goals. “As the President of the Republic, I am well aware that we cannot achieve development and progress without peace. Peace is the source of our happiness, our growth and our future. “My Government will consider a request to declare this day November 21, as the ‘National Day of Peace and Family’, “ he said. The festival which was open to all, was hosted by the Family Federation for World Peace and Unification (FFWPU), an organisation that complements the United Nations in promoting peace throughout the world. “You are indeed welcome to fulfil your mission of preaching unity, peace, love, harmony and cooperation in Zimbabwe as these constitute the fundamental bedrock for human advancement, a better world and an improved quality of life, across all sectors of human endeavour,” said the President. FFWPU which operates in 194 countries worldwide, has several affiliates such as the Universal Peace Foundation (UPF) that encourages all religions to dialogue and cooperate for peace, the International Association of Parliamentarians for Peace (IAPP) that promotes cooperative peace building and the International Chiefs Association for Peace Prosperity (ICAPP) that aims to address rural, socio- economic and political problems. President Mnangagwa said the coming of the FFWPU into the country marks a new beginning for Zimbabwe, and an era of economic rejuvenation. “My Government has set up a Peace and Reconciliation Commission that, among other things, superintends over our efforts to unite and forgive each other over the conflicts and misunderstandings of the past. To that end, I will continue to blow the sirens of peace and unity which have become our trademark,” said President Mnangagwa. He said just like any other political party leaders, he had taken his crusade to religious institutions and his rallies. The President said Zimbabweans are on a thrust to re-build the country across all economic sectors, a process that requires diligence and hard honest work, tolerance of each other’s views as well as self-belief. “Attaining such goals calls for a discerning spirit, a corruption free citizenry and unity of purpose, buttressed by peace, love and family unity,” said the President. 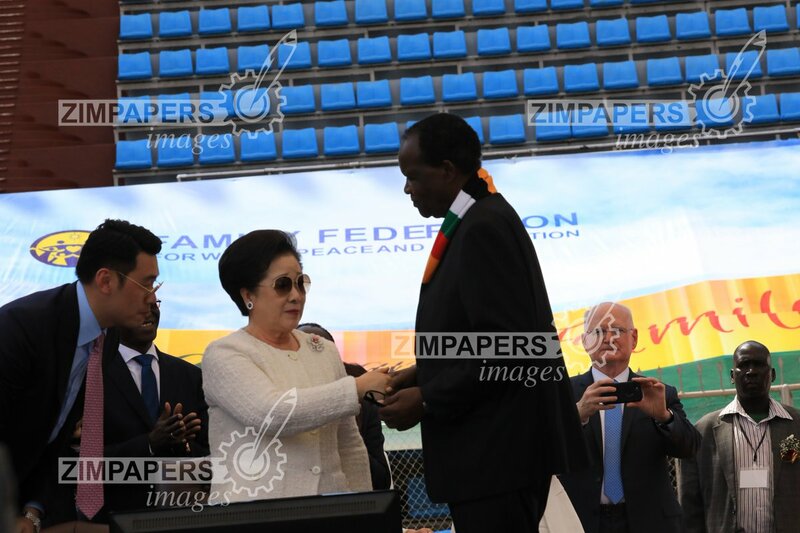 Dr Hak Ja Han Moon, the co- founder of the FFWPU graced the ceremony and was joined by the FFWPU local leader, Archbishop Johannes Ndanga, who is also president of the Apostolic Churches Council of Zimbabwe. Archbishop Ndanga said Dr Moon had not come for church business but had specially chosen Zimbabwe as her first stop in Africa to encourage national unity.